The Pfaff Line of Sewing / Embroidery Machines & Cover Stitch / Sergers, with 15 models from which choose. 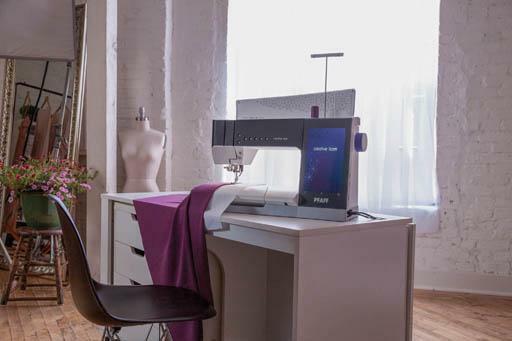 From the Ultimate Pfaff Creative Icon Sewing / Embroidery Machine to the Affordable Basic Hobby, Pfaff has a machine for every sewing enthusiast. Whether your a first-time-sewer or a Creative artist, there is a Machine at a price to fit any budget. Your choice in Machines is Clearly PFAFF! Choose from the Console Menu at the Left Side of this page - the Line of Machines - You wish to view - to locate the Model Your looking for! The Creative line of Machines is Pfaff's Premium line of Sewing / Embroidery Machines! The Expression Line of machines are the Premium Computerized Sewing Machines! The Ambition Line of machines are Mid priced Computerized Sewing Machines! The Pass Port Line of machines are Smaller Lightwight Computerized Machines for on-the-go! The Select Line of machines are the Premium Mechanical Sewing Machines! The Smarter by Pfaff Line of machines are value packed Economical Sewing Machines at a budget minded price!